What is “population health management?” Healthcare jargon can be thick, but the phrase just means keeping people healthy. And how do you keep people healthy? 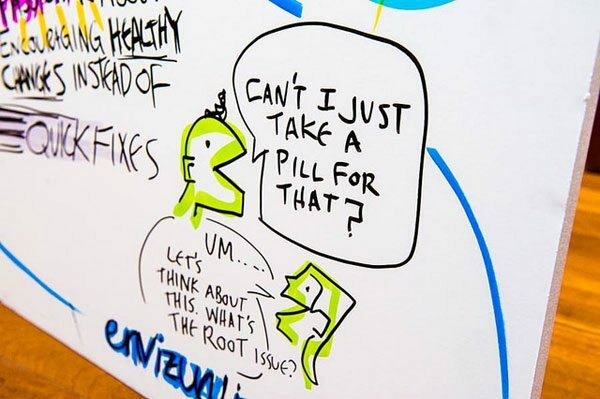 To use more jargon, you address the “social determinants of health,” a fancy way of saying that health has less to do with doctor’s visits, medicine, and health insurance than you may think—and a lot more to do with addressing barriers that impact your health, such as poverty, environmental hazards, lack of access to healthy food, and a built environment that makes walking and exercise difficult. 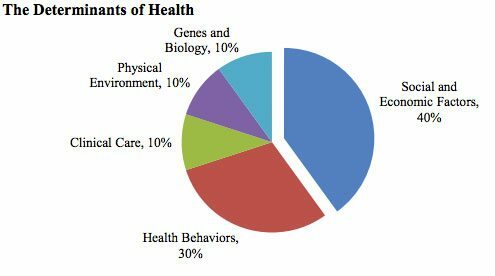 As the above chart, courtesy of the Minnesota Department of Health, shows, genetics and the quality of healthcare only account for 20 percent of health outcomes; the rest concerns factors such as poverty, diet and exercise, and the physical environment—all of which are interlinked, since if you’re poor, you are more likely to live near environmental hazards and less likely to have a walkable neighborhood or be near a healthy grocery store. Nonprofit Quarterly covered some foundation initiatives focused on addressing these barriers to health and wellness here. How does this play out? Last month, Nonprofit Quarterly wrote about lead poisoning, citing a study that showed cost savings that would result from lead abatement. But even more important than the money is the impact on children’s health. A 2013 Centers for Disease Control study found lead poisoning in 1 in 38 of America’s children or 535,000 young Americans. In some neighborhoods, this number is far higher: As an award-winning series from Reuters documented, “In some pockets of Baltimore, Cleveland and Philadelphia, where lead poisoning has spanned generations, the rate of elevated tests over the last decade was 40 to 50 percent.” Nationally, one in five cases of attention deficit hyperactivity disorder (ADHD) are traceable to lead poisoning. The number of deaths we calculated as attributable to low education is comparable to the number caused by acute myocardial infarction (192 ,898), a subset of heart disease, which was the leading cause of death in the United States in 2000. The number of deaths attributable to racial segregation is comparable to the number from cerebrovascular disease (167 ,661), the third leading cause of death in 2000, and the number attributable to low social support is comparable to deaths from lung cancer (155 ,521). Slowly but surely, these numbers are driving major change in healthcare. As Bill Frist, former Republican Senate Majority leader from Tennessee, notes, prodded by Obamacare, the Center for Medicare and Medicaid Services, the largest single payer for hospital care in the United States, is shifting payment from “volume to value”—or, as Frist helpfully puts it, “paying for health outcomes rather than simply service volume.” But if most health outcomes have to do with matters outside the hospital walls, what is a hospital to do? With 30 percent of our population in poverty and bearing a huge burden of disease, the health care institution needs to be at the table, working with our communities and supporting the improvement of education, commerce and health…. The missing link is whether people have a sense of control over their lives, something that requires individuals and communities to have agency. In Los Angeles, UCLA’s medical center has reduced costs and improved health outcomes by hiring 30 community health workers who, “work on patient advocacy and linkage to resources, and they really deliver care, taking a minute to understand social determinants of health by asking questions and developing relationships with patients.” In Kalamazoo, Michigan, the nonprofit hospital reduced the uncontrolled diabetes rate among its patients by 29 percent in 90 days, by using a community health care model like UCLA’s, where “care coordinators” conducted home visits to help patients with their medication, diet and exercise regimens. Those are all non-clinical in nature but they have a tremendous impact…. By assessing those social factors, as well as the patient’s motivation to change unhealthy habits—smoking cessation, for example—the health system can often then connect them to a community resource for help, she said. Clearly all of this creates a new opportunity for community partnerships—such as between nonprofit hospitals and nonprofit community development corporations.